Cal State East Bay is dedicated to serving students with a range of enrollment related services such as admission, financial aid, registration, and student financial services. 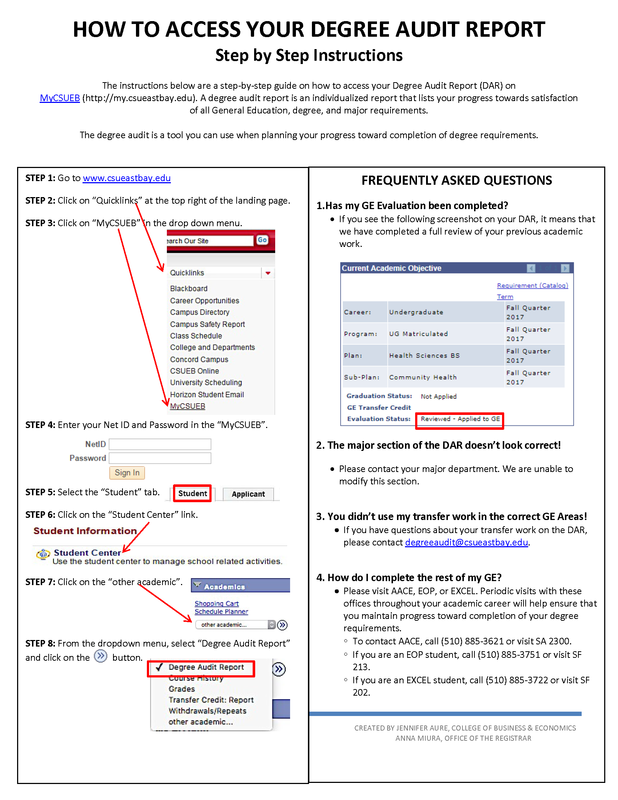 You should frequently check the student self-service online interface, MyCSUEB, for information and updates to your personal account. For more information, our staff is available to assist you by phone or in person during these hours of operation. You may reach the following offices by telephone Monday through Thursday 8:00 a.m. – 4:00 p.m. and Friday: 10 am - 4:00 p.m.
For enrollment related services, please visit the Enrollment Information Center, on the First Floor of the Student Services Administration Building located near Valley Business & Technology Building, Hayward Campus. The campus is located at 25800 Carlos Bee Blvd., Hayward, CA 94542. Friday 10:30 a.m. - 5:00 p.m.
Friday 9:00 a.m. - 4:30 p.m.
Open Monday - Thursday 9:00 a.m. - 6:30 p.m. for Admission, Financial Aid, and Registrar general questions. Closed Fridays and weekends. Quarter Break hours: Monday-Thursday 10:00am-5:00 pm. Closed Fridays and weekends. Financial Aid counselor drop-in advising is available the second Tuesday of each month & last Wednesday of the month from 3:00 - 6:00 p.m. The above listed hours of operation are subject to change, and not applicable when the University is closed for regularly scheduled holidays. Check the University Calendar for holidays.